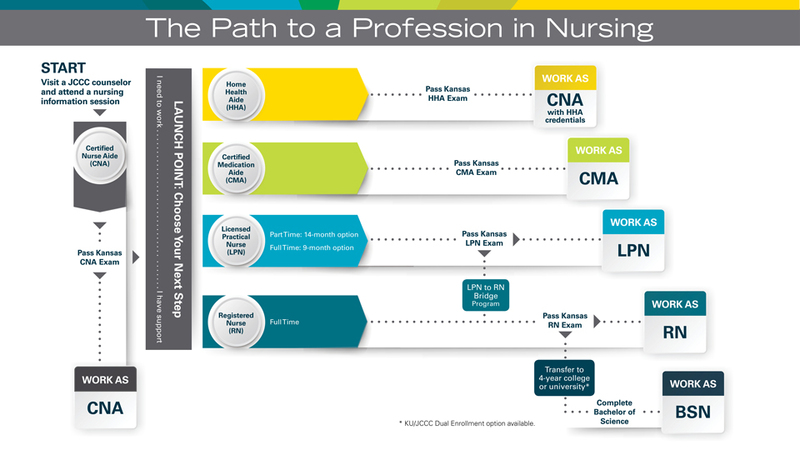 From Certified Nurse Aide (CNA) to Registered Nurse (RN), the Nursing program at Johnson County Community College gives you real-life, hands-on clinical training. With experienced instructors and small class sizes, you’ll have time and attention to learn the skills you need to provide exceptional patient care. You will get hands-on experience at our Healthcare Simulation Center, located on the main JCCC campus, and also at the Olathe Health Education Center. These centers have the same look, feel and equipment you’ll find in a real hospital, including surgical, labor/delivery and recovery rooms. Highly sophisticated patient simulators can be programmed with hundreds of symptoms to test your skill and knowledge. Each room is equipped with video recording equipment to film you in action, providing you with valuable feedback and debriefings for continued improvement. JCCC has strong partnerships with long-term-care facilities, clinics and area hospitals, giving you real-world learning experiences and opening doors for your career. The Nursing programs at JCCC are accredited and approved by the Kansas State Board of Nursing and the Kansas Board of Regents. Area medical professionals volunteer on our advisory committees to keep instruction relevant and to strengthen the curriculum-career connection.